As online advertising becomes the focus of many promotional campaigns, conventional signs remain important in drawing in attention to companies and their goods and services. Unlike the painted signs of yesterday, modern signs are printed precisely and can last for years, depending on the materials used. Our Los Angeles same day sign printing services offer an extensive selection of signs that can be mounted indoors or outdoors using a variety of inks and materials. With on-site sign design services, our print shop provides a singular solution for companies that need high-quality advertising materials right away. Using signs lets customers know when a new business is open and what kind of services they are offering. Because signs are available in many forms, every business can find the right solution for its promotional projects. For example, banners can be raised outside of storefronts on windows or walls, or they can be used indoors to announce sales. Magnetic signs can be attached to vehicles without permanently altering their surfaces. With our same day sign printing in Los Angeles, companies can get window signs for display on glass and vinyl signs for professional advertising on virtually any smooth surface, also. 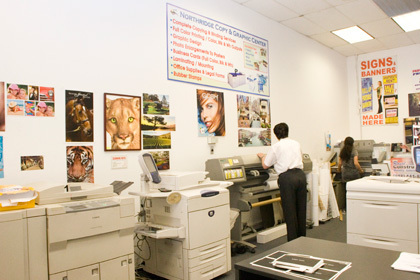 Our Los Angeles same day sign printing services can produce signs to meet a wide range of needs. At the design stage, our graphics professionals can craft signs from scratch or work with clients to make their own designs. Logos, text and pictorials can be included. We can also select colors and fonts to emphasize the focus of the promotion. Once the design is complete, we can print signs using virtually any color to match the trademarks of the company. Signs are most frequently displayed by companies, but consumers and non-profit organizations also use signs for celebrations or fundraisers. At every step of the process, our same day sign printing in Los Angeles ensures that clients are always satisfied with their results. We can print signs on an individual basis or in large runs to support promotional campaigns of all sizes. 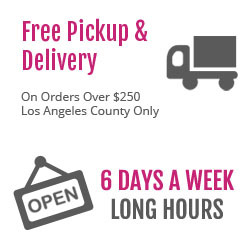 To find out more about our sign printing services and our available options, clients can contact our Los Angeles same day printing shop online or by phone.